Quick-Kleen | Alpine Products, Inc. The perfect industrial strength water soluble cleaner/degreaser which quickly emulsifies, suspends and removes all types of oils, greases, and grime in commercial and industrial applications. 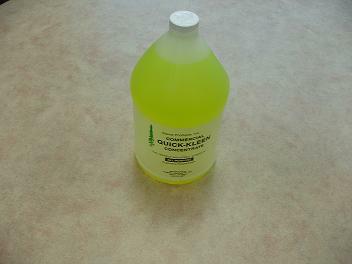 Formulated to quickly penetrate and remove organic soil, vegetable and animal fats, oils, protein, blood and starches. Completely safe for all washable surfaces, including aluminum. Excellent for use on walls, floors, tile, marble, linoleum, carpets, upholstery, stainless steel, chrome and machinery; any surface that can be cleaned with water.